Whey Protein Isolates are the purest form of whey protein. By using Whey Protein Isolates as the primary protein source, Optimum Nutrition are able to pack 24 grams of the purest, muscle-building protein per serving, with a lot less of the fat, cholesterol, lactose, and other stuff that you can do without. 100% Gold Standard Whey is best enjoyed first thing in the morning and/or during the 30 minutes just before (or immediately after) training. Just mix one rounded scoop with 180-240ml of cold water in a shaker/blender or stir with a spoon. Try adding to yoghurt, brownies, cookies and more for a protein boost! Protein Blend (Whey Protein Isolate (Milk), Whey Protein Concentrate (Milk), Whey Peptides (Milk)), Natural and Artificial Flavors, Cocoa (Processed With Alkali), Lecithin, Salt, Creamer (Sunflower Oil, Maltodextrin, Modified Food Starch, Dipotassium Phosphate, Tricalcium Phosphate, Tocopherols), Acesulfame Potassium, Sucralose, Lactase. 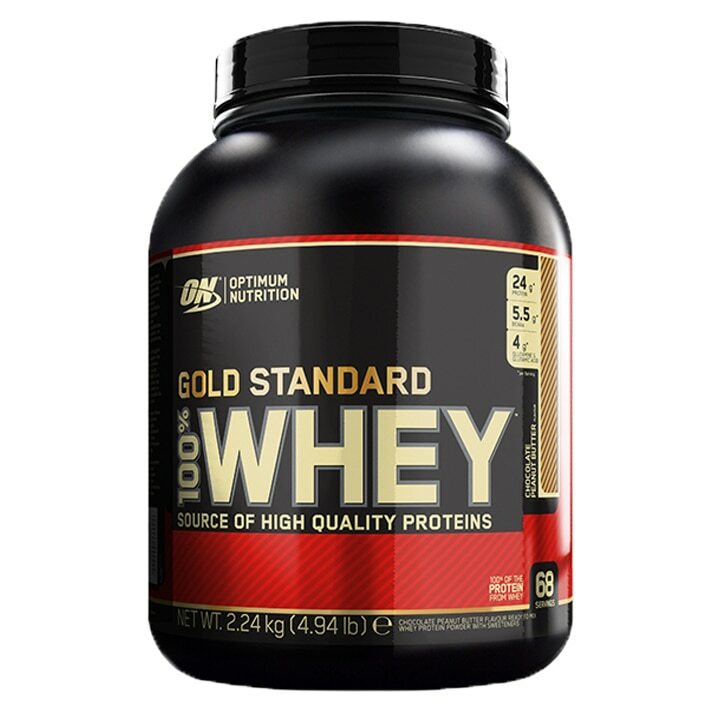 Optimum Nutrition Gold Standard 100% Whey Powder Chocolate Peanut Butter is rated 4.8 out of 5 by 42.